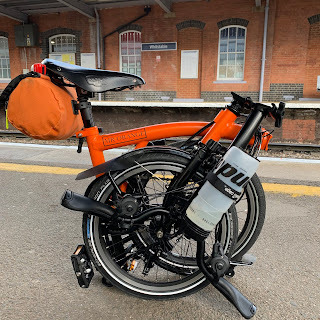 My Orange Brompton: What to wear??? The Brompton World Championships is but a step away and I have been deliberating and cogitating about the all important question what to wear? Mrs Orange Brompton and my children could see me in all my glory. Now I must stress that Mrs Orange Brompton has seen and approved every item I am going to wear on an individual basis. Upon seeing me decked out in the full Brompton World Championships outfit it induced a two word review/summation. "Jesus Christ!" I took this as a complement as was pretty much the response I expected and if I am being brutally honest, wanted. It did make me think however... If I am to wear this outfit for the Marathon I feel I am going to get and become too hot, despite the weather conditions. I might therefore wear something else for the Marathon and change into this little number for the BWC onwards. For me it certainly makes sense. I used the Raw Lacquer S2L and did want to stay out for 30 minutes but the heavens opened so had to stop. The ride was over fairly flat ground but quite a few inclines of significance that were about 200 metres each. So, I think that it is going to be two outfits for me. What do you out there think? Perhaps, the new stats, after the service, will be significantly better!